Blowout Sale! Free Shipping Included! 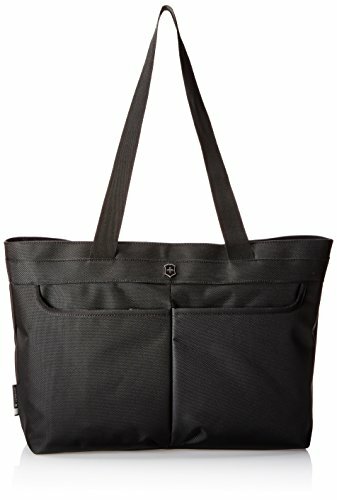 Save 53% on the Victorinox Werks Traveler 5.0 WT Shopping Tote, Black, One Size by Victorinox at Just Gathering. MPN: 323011. Hurry! Limited time offer. Offer valid only while supplies last. The perfect size for a carry-on or everyday bag, this tote contains storage for a water bottle or umbrella, a tablet or eReader and lots more. The perfect size for a carry-on or everyday bag, this tote contains storage for a water bottle or umbrella, a tablet or eReader and lots more. Spacious tote is the perfect size for a convenient carry-on or everyday bag. Interior features two padded electronics pockets sized to fit a tablet or eReader, two mesh peripherals pockets, a key fob, a water bottle/umbrella pocket and a full-length zippered lining pocket. Exterior features two zippered storage pockets. Rear pocket converts to a sleeve for sliding over the handle system of wheeled luggage. Two wide, webbing straps allow for carrying by hand or over the shoulder.